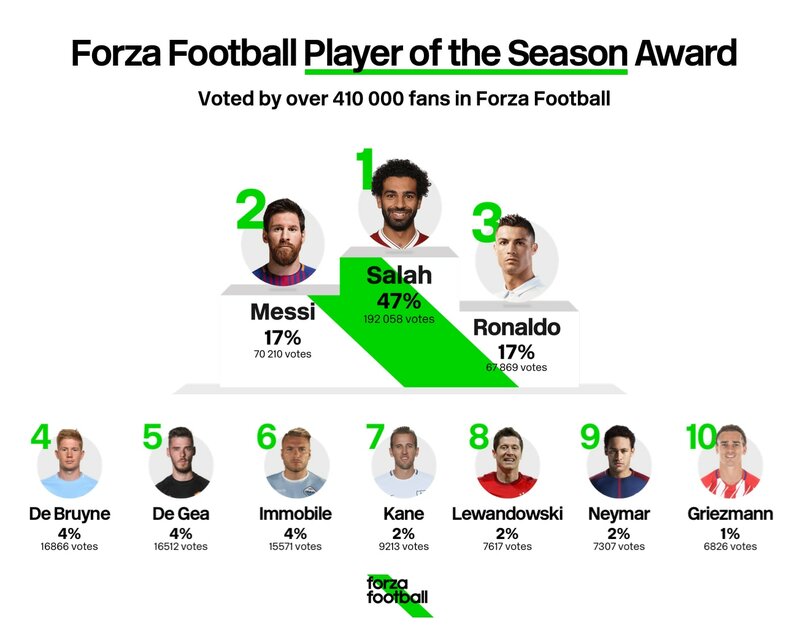 Neither Cristiano Ronaldo nor Lionel Messi were the best player in the world this past season, according to you, the lovely users of Forza Football. Over 410 000 football fans from 35 countries participated in the poll, which was conducted in the app between May 12-18 2018. That is an amazing turnout – almost half a million users! We wanted to create a huge, global fan award – and now we have! As you can see the Egyptian absolutely crushed the competition. He almost got more votes than all the other nine players together. • In Spain 40 per cent of the users voted for Messi. Salah was their second choice with 27 per cent while Cristiano Ronaldo was third with 20. • Argentina of course went with the Barcelona forward who got 63 per cent of the country’s votes with Salah second on 24. • For the Portuguese users Ronaldo was the clear winner, as expected, with 59 per cent of the votes. Salah got 25 per cent in second place. In 26 of the 35 countries where we conducted the poll Mo Salah got over 40 per cent of the votes. The highest number came in his home country Egypt – Salah 74, Messi 10 and Ronaldo 7. • Belgium: Salah 33, De Bruyne 30, Messi 14. • Poland: Salah 38, Lewandowski 23, Messi 16. • Mexico: Salah 34, Messi 33, Ronaldo 23. • India: Salah 34, Messi 24 and Ronaldo 23. • Brazil: Salah 39, Ronaldo 24, Messi 17. 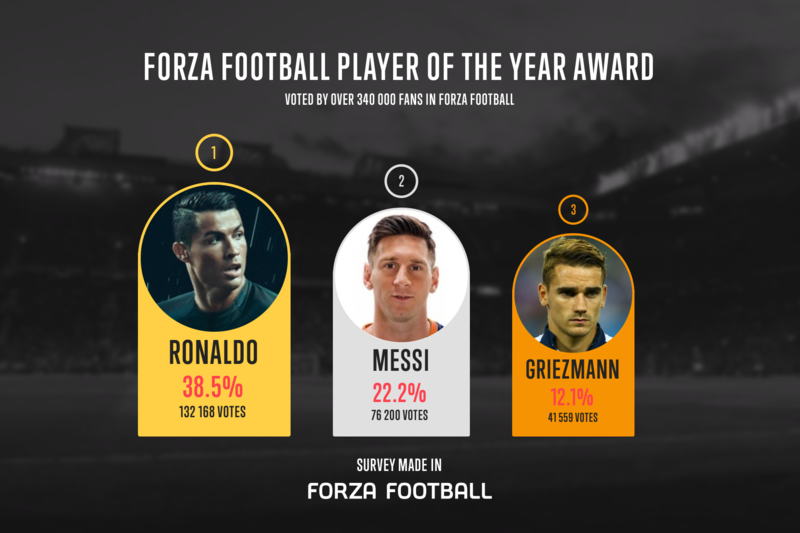 In the end only 2341 votes separated Messi from Cristiano Ronaldo, who was the clear winner last time around when we conducted Forza Player of the Year in December 2016 (as you can see below). In our new poll the following countries had Ronaldo as number two, ahead of Messi: South Africa, Nigeria, Chile, France, Cameroon, Kenya, Germany, Switzerland, Turkey and Italy. And these countries had Messi ahead of Ronaldo: USA, Australia, Canada, Colombia, Uruguay, Austria, Russia, The Netherlands, Denmark, Sweden, Greece, United Arab Emirates and Ghana. In the UK both Ronaldo and Messi got 10 per cent of the votes, way behind Salah with 54. Three countries had the Manchester United goalkeeper David De Gea in their top three: Norway, Ireland and Kenya. And finally – in Italy, where Forza Football has most users, did the Serie A joint top scorer Ciro Immobile grab the third place with 10 per cent of the votes, behind Salah and Ronaldo. 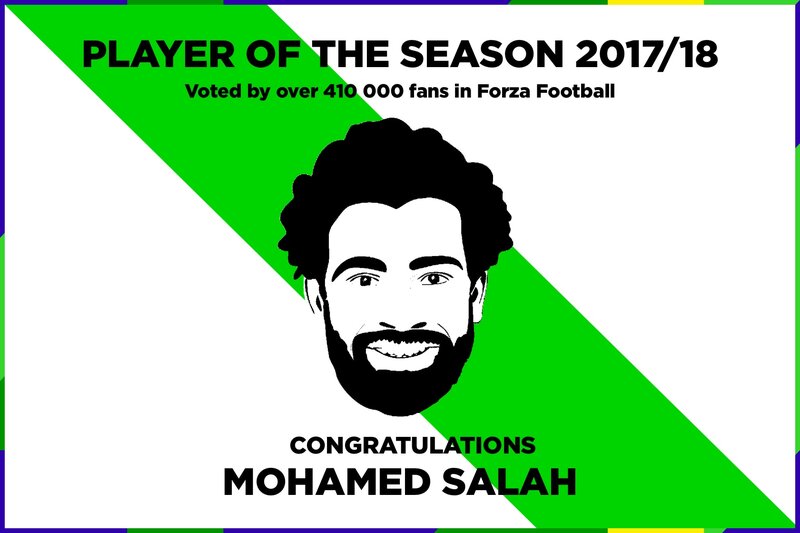 Once again, congratulations Mohammed Salah! And many, many thanks to all of you who participated in the poll. Hopefully your opinion will be picked up by several media outlets and spread around the world. Loads of love from the Forza Team!